A couple of years ago I happened upon Bel Canto, a novel by Ann Patchett. The story moved along at a crawl. The plot was minimal. And yet I was entranced by the novel and couldn’t put it down. The characters were fascinating, the setting was described in such rich detail, the atmosphere was enchanting, and Patchett’s writing was exquisite. I don’t know why it took me so long to pick up another of her novels. I suppose I didn’t want to be disappointed. After all, it seemed unlikely that she could write another such masterpiece. 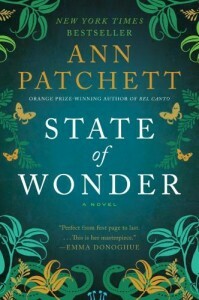 State of Wonder was published last year by HarperCollins, and I finally got around to reading it this past week. Is it on par with Bel Canto? Well, no. But in my opinion, few books are. Once again, however, the characters are wonderfully drawn and the settings are vividly brought to life. Once again, Patchett evokes an atmosphere that is spellbinding. And I found this novel even more emotionally engaging than its predecessor; several scenes were intensely moving. It’s rare, even in otherwise excellent novels, that I encounter an ending that is fully satisfying. This one is unforgettable. I think it’s perfect. Some detractors of the book complain that the scientific aspects of the plot are highly questionable, and I have to agree. For me, though, those elements were only mildly annoying and not central to the concerns of the novel. Overall, I highly recommend State of Wonder. 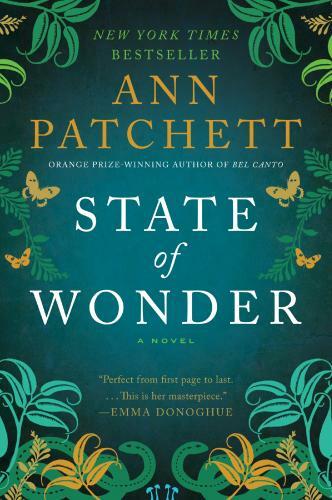 I can’t wait to read Ann Patchett’s other novels. Based on the two I’ve read so far, I’m convinced that she is one of our finest living authors.